I am dizzy with gratitude after last night's packed-house poetry reading. Over 60 people turned out to celebrate the life and work of William Stafford, Oregon's most famous poet. To honor the prolific writer, Stafford events and readings take place every January all over the world. 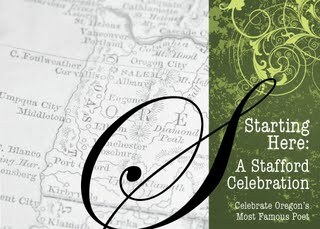 Last night's event marked the first Stafford celebration in Yachats, Oregon (a coastal town of just 700 residents). • Writers far and near, young and old, for sharing words & good spirits. • An encouraging audience, filling the evening with laughter, energy and enthusiasm. • Green Salmon Coffeehouse for supporting the arts and letting us rent (and rearrange) their space. • Richard Sharpless for setting a coffeehouse-music vibe, and creating a Stafford-inspired song just for the event. Next Up: The fourth annual Off the Page reading in April! This event, featuring Oregon writers, gets bigger and better each year. Stay tuned for details (and pop me an email if you'd like to get on the mailing list).